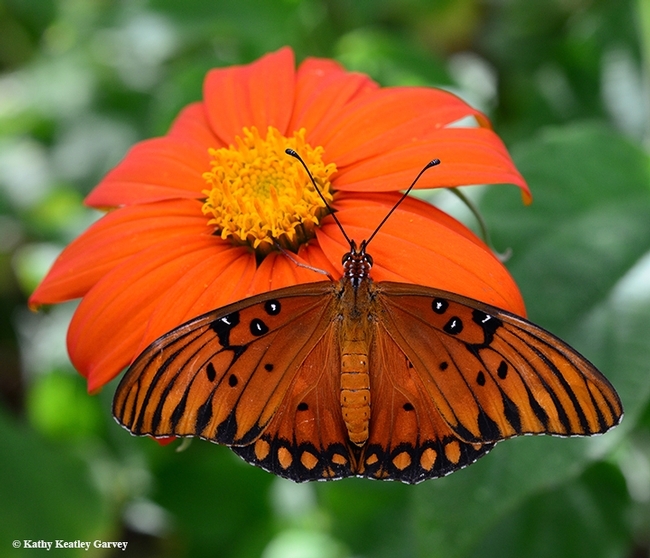 When we think of orange and autumn, we think of the marriage of the Gulf Fritillary (Agraulis vanillae), and the Mexican sunflower (Tithonia). 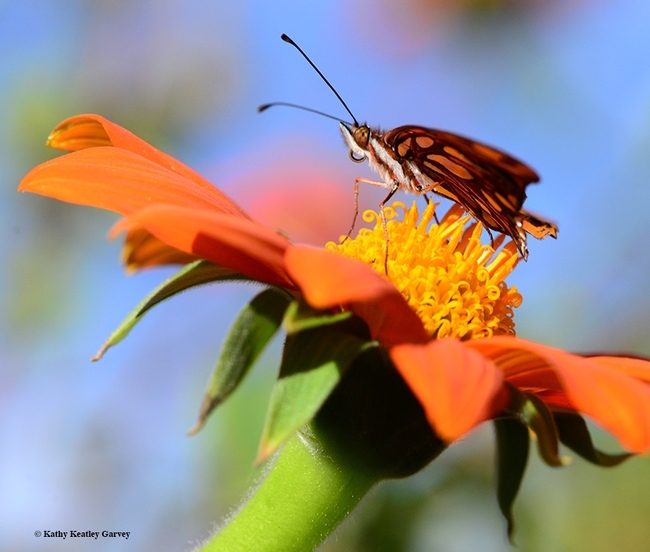 The silver-spangled Gulf Fritillary, a showy orange butterfly, looks like two different species. When it spreads its wings, it's orange. The underwings: silver. 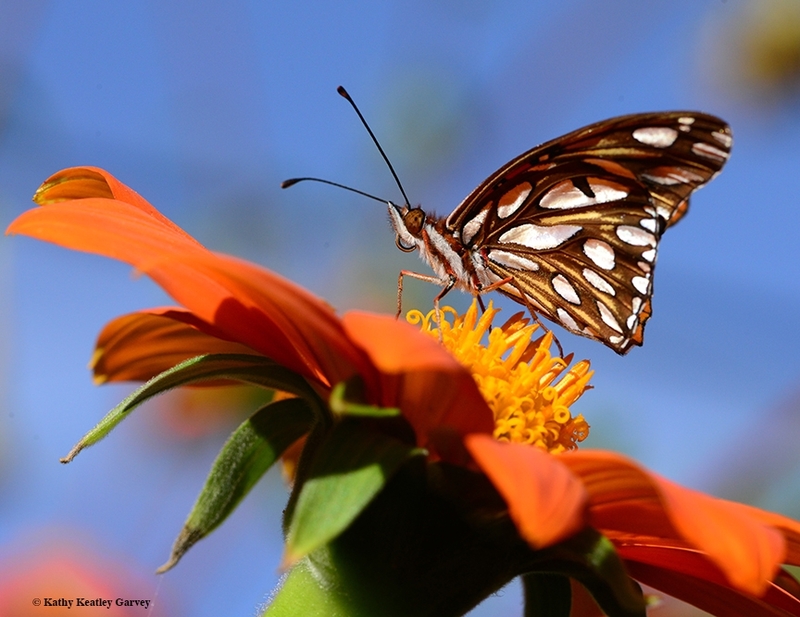 "Dazzling," agrees butterfly guru Art Shapiro, UC Davis distinguished professor of evolution and ecology. "This dazzling bit of the New World Tropics was introduced into southern California in the 19th Century --we don't know how-- and was first recorded in the Bay Area before 1908, though it seems to have become established there only in the 1950s," he says on his website. "It can be quite common in the East and South Bay --particularly in Berkeley--and has been found breeding spontaneously as far inland as Fairfield where, however, it is not established. There are scattered records in the Central Valley and even up to Folsom, perhaps resulting from people breeding the species for amusement or to release at social occasions." The Gulf Frit bred in Sacramento in abundance on Passiflora in the early 1960s, Shapiro relates. "It seems to have died out by the early 1970s, however. Intolerant of hard freezes, it still managed to survive the record cold snap of 1990 that largely exterminated the Buckeye regionally!" Its host plant: Passiflora or passionflower vine. Plant it and they will come (at least in this area)! 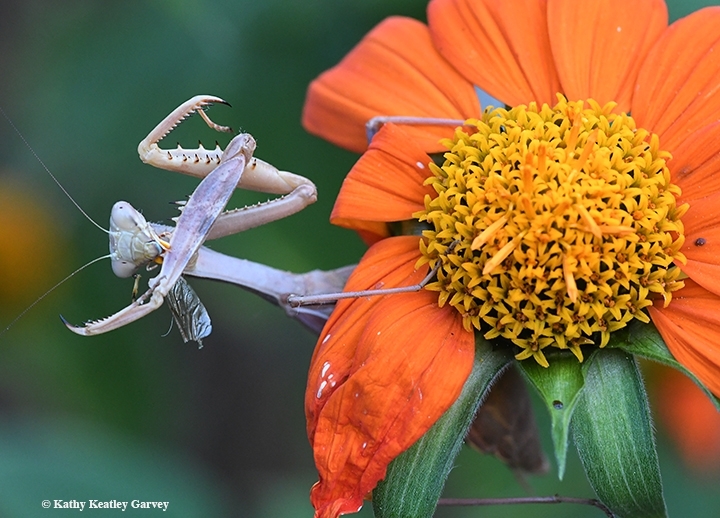 Henrietta, our Stagmomantis limbata praying mantis, perches on a Mexican sunflower (Tithonia). She is as patient as she is persistent. 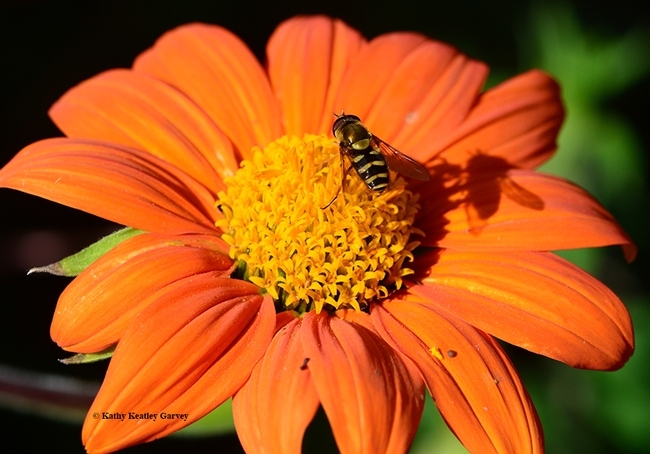 The drone fly, aka syrphid and also known as a hover fly or flower fly, makes the fatal mistake of touching down on the same blossom. Henrietta eyes it hungrily. Faster than a blink of the eye, she snares it, clutching it between her spiked forelegs. "Well, of course, I like drone flies," she appears to be saying, between mouthfuls. "Thank you for asking." Praying mantids are not known for their table manners. It's grab, hold and eat. The cycle of life in the garden. The Frit and the Fly: Who Wins? 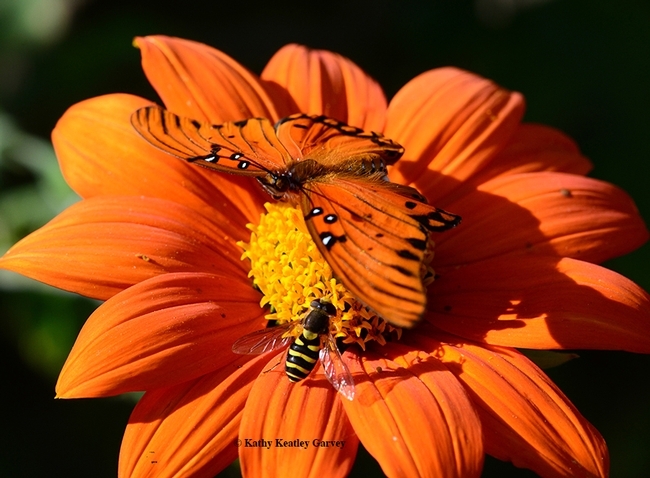 That would be the Gulf Fritillary (Agraulis vanillae) and the syrphid fly (family Syrphidae), aka flower fly or hover fly. They meet on a beautiful autumn day on an equally beautiful Mexican sunflower (Tithonia rotundifolia). The season is winding down. "I was here first!" the Gulf Frit proclaims. "I was here second!" the fly says. 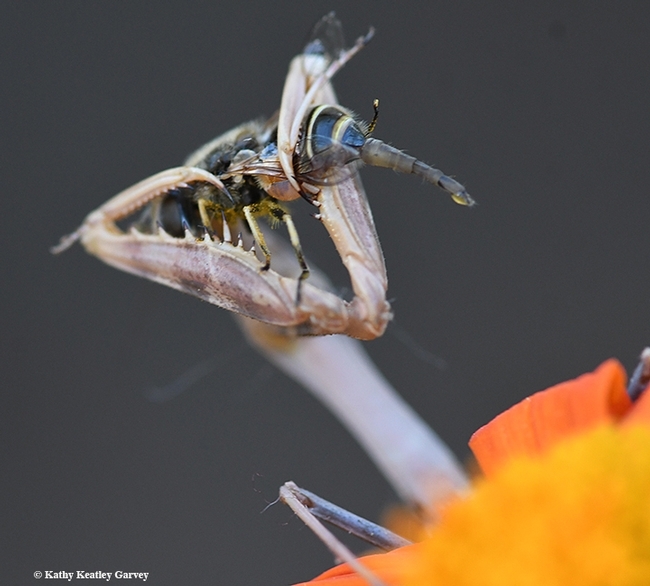 The yellow-and-black striped fly, masquerading as a bee, is determined to sip some nectar. It edges closer and closer. The newly eclosed butterfly simply wants to dry its wings before taking off. The fly is more persistent. And more hungry. 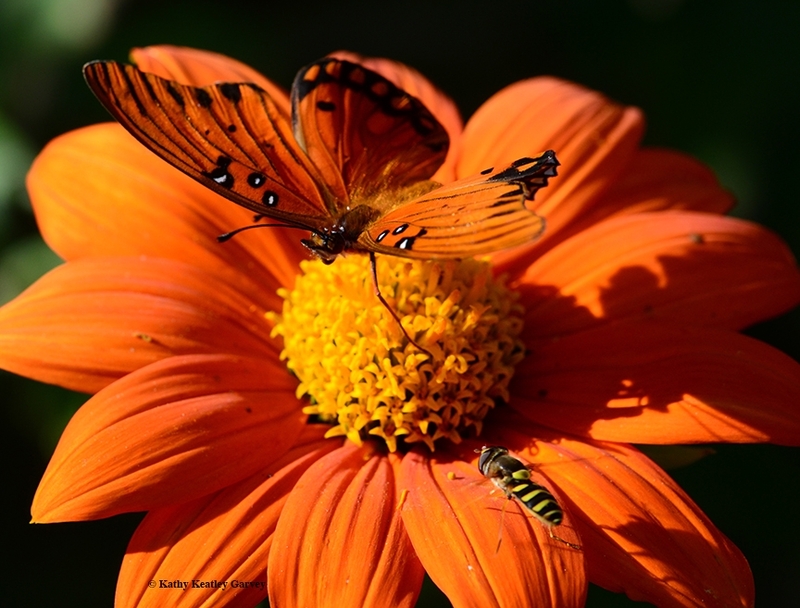 The fly brushes the butterfly. The butterfly takes flight. Score: Fly: 1; Butterfly, 0. 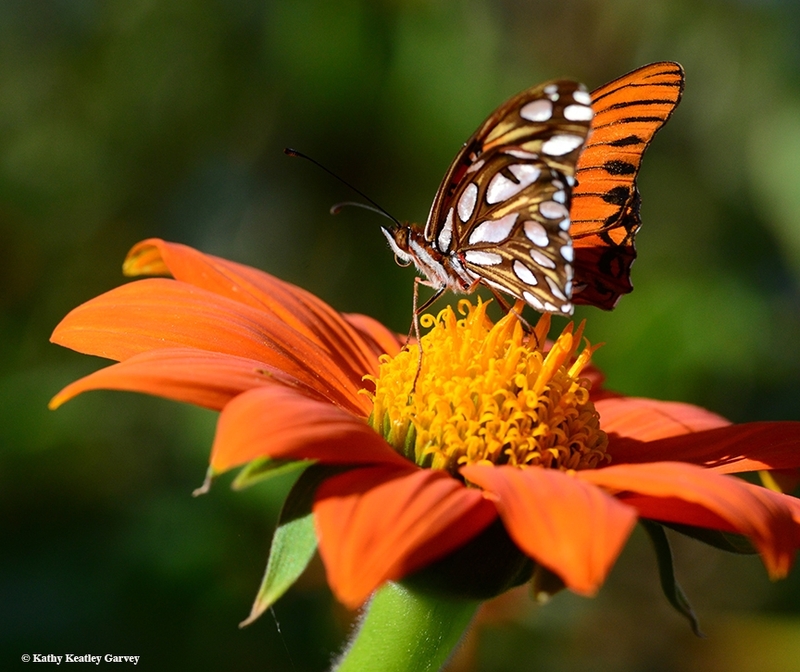 It's Halloween and scores of trick-or-treaters are donning monarch butterfly costumes. 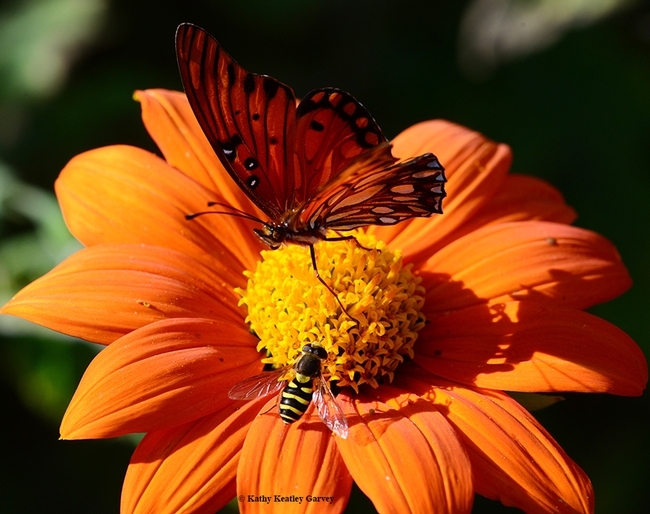 But they can't do justice to the living monarchs, those iconic, majestic butterflies that are always dressed in Halloween colors: black and orange. 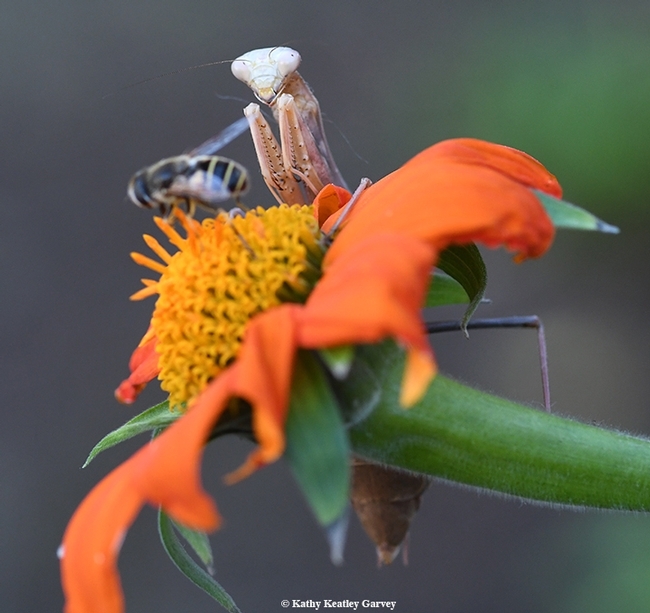 It's always a treat to see them but they have to avoid the "tricks"--predators and parasitoids. Among the last monarchs we reared in September: a brightly colored female, healthy and strong and rarin' to go. Where is she now, on Halloween? Is she overwintering in Santa Cruz or Pacific Grove? 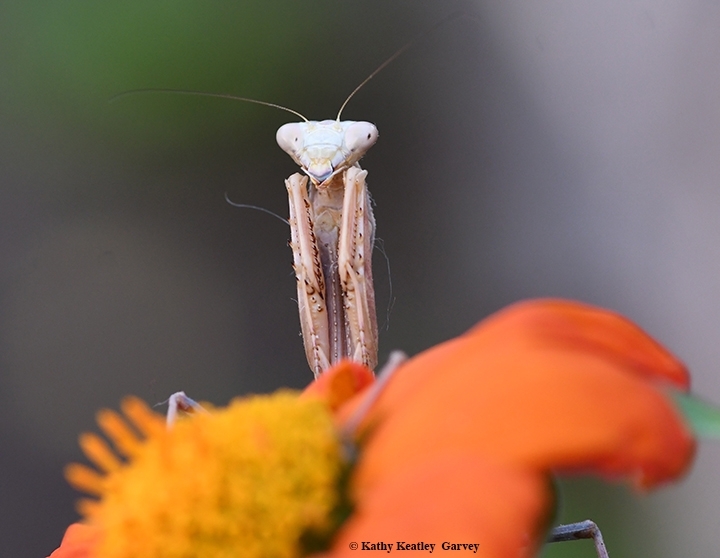 Or, did a predator, perhaps a California scrub jay or a praying mantis, nail her? We don't known "witch" way she went, but as she fluttered away, we wished her "Safe travels!" 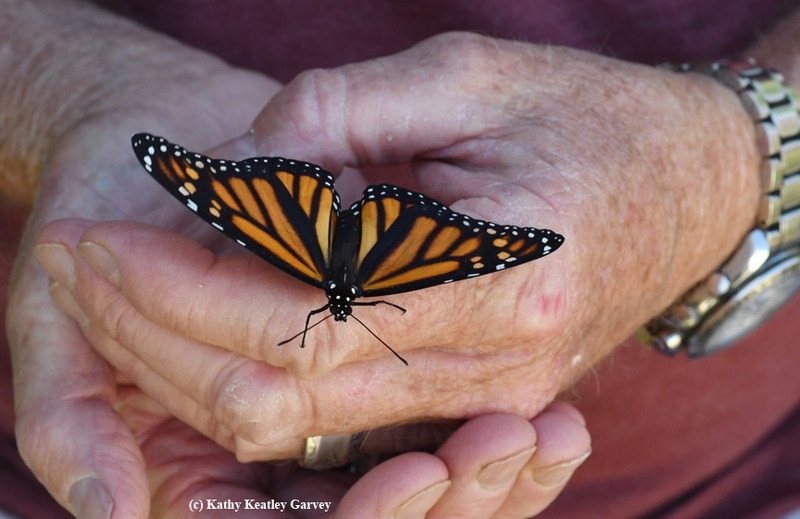 Where to see the overwintering monarchs in California? They've been found at more than 400 sites along the California coast, according to the Xerces Society for Invertebrate Conservation. "The mild winters of the California coast are a perfect haven from the harsh cold weather found in our country's interior," Xerces says on its website. 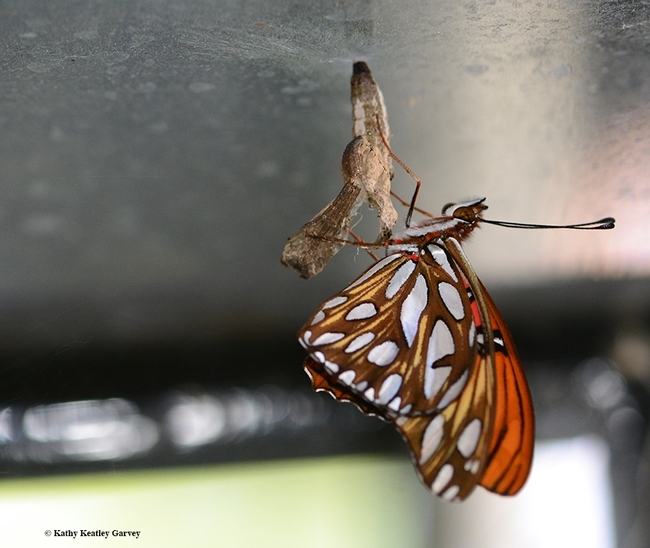 "Monarchs take advantage of this climate and often use the same overwintering sites year after year. Congregations of overwintering monarchs have been found at more than 400 sites along the California coast, from Mendocino County in the north to San Diego in the south. 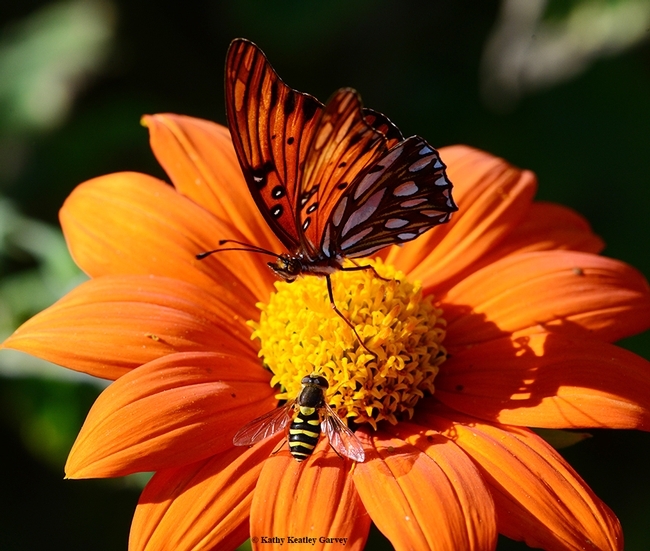 For many people, the arrival of autumn along the California coast is marked by the flutter of orange and black as monarchs arrive at these groves and settle in for the winter." 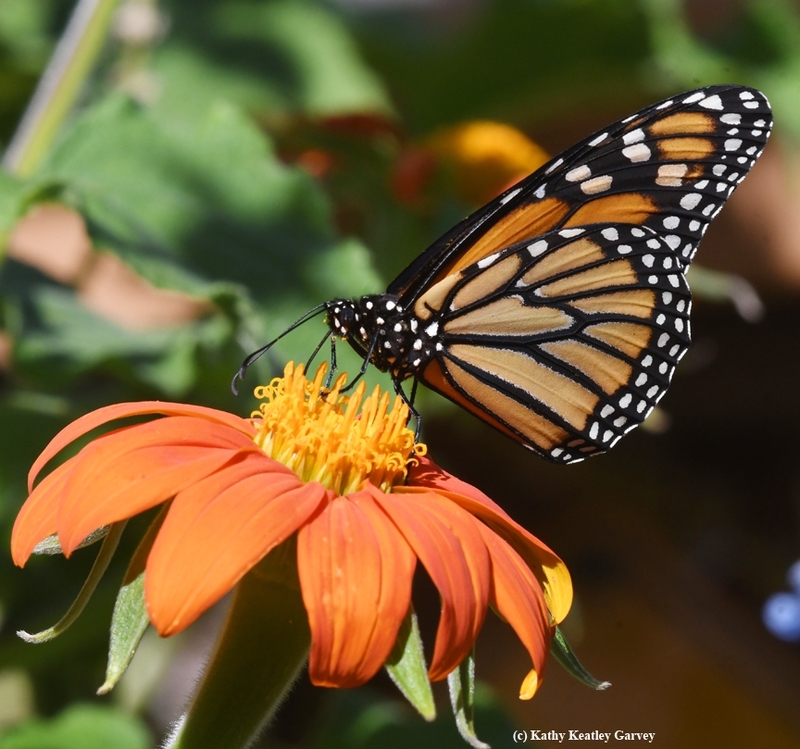 "The last few years have witnessed low numbers of butterflies throughout the region compared to the late 1990s, but there are still many places to view overwintering monarchs and get involved!" 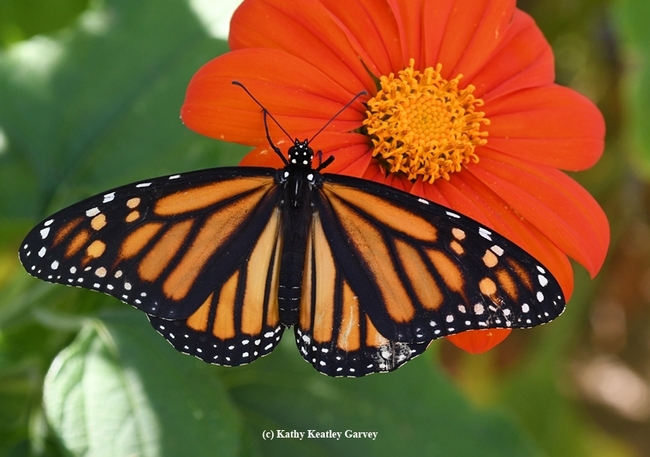 Check out the Xerces' map showing monarch overwintering sites in California. They can't drain your bank account. They can't open up new credit cards. They can't get medical treatment on your health insurance. But they are identity thieves, nonetheless. 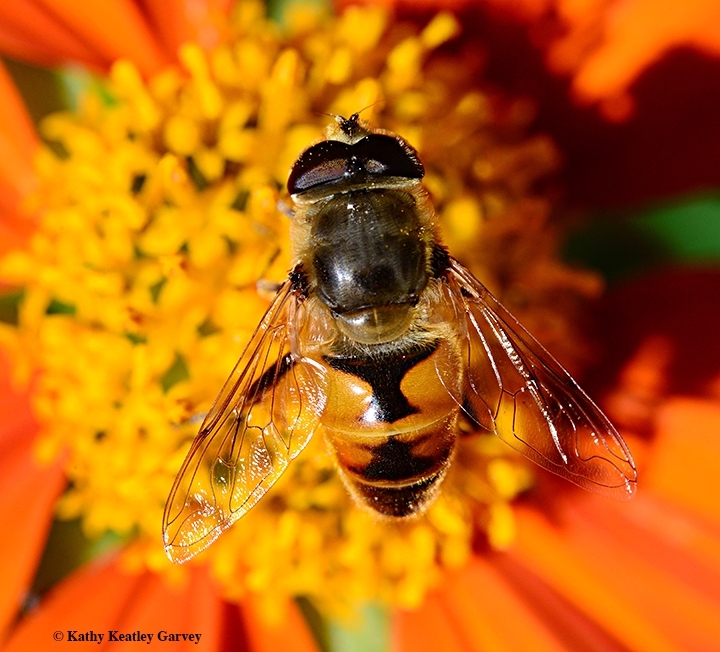 Meet the drone fly (Eristalis tenax), often mistaken for a honey bee. Indeed, it's about the size of a honey bee. 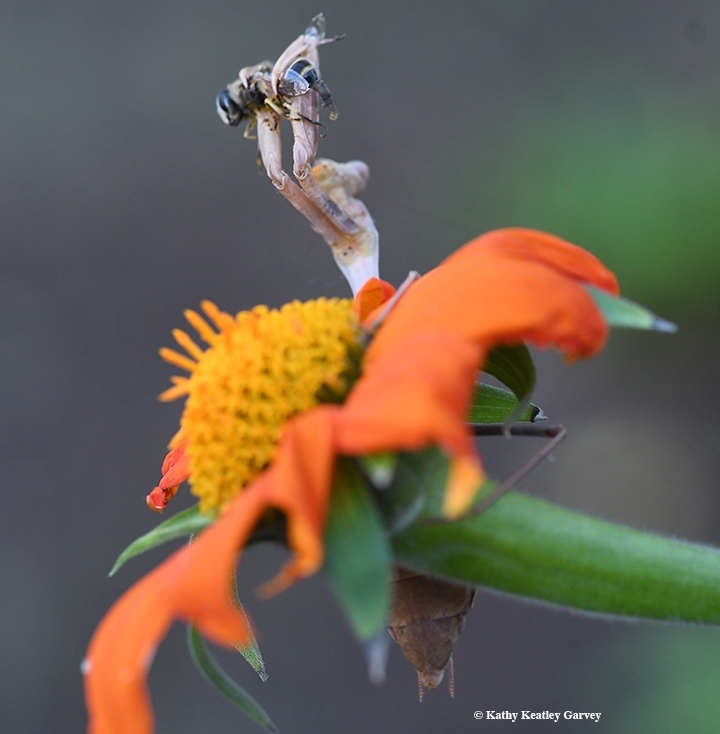 In its adult form, it's a pollinator, just like the honey bee. 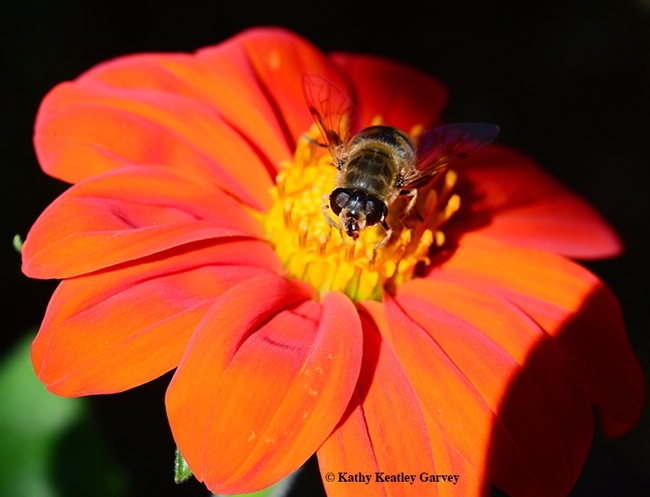 Unlike a honey bee, however, the drone fly "hovers" over a flower before landing. And unlike a honey bee, the drone fly has one set of wings, large eyes, stubby antennae, and a distinguishing "H" on its abdomen. Robbin Thorp, UC Davis distinguished emeritus professor of entomology, jokingly calls the drone fly "The H Bee." 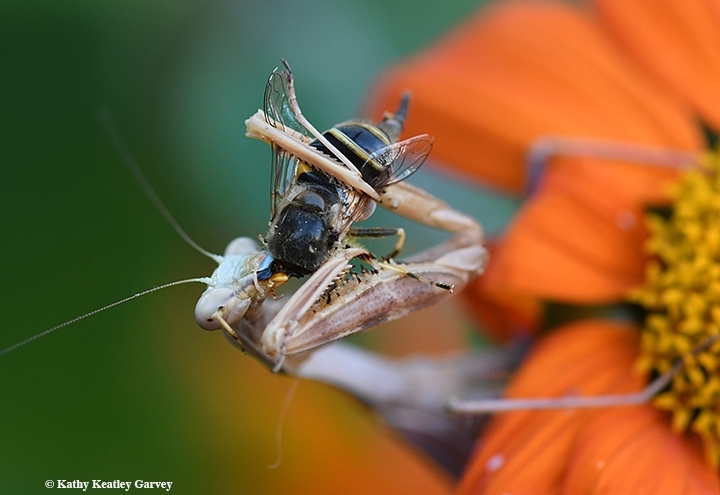 Drone fly larvae are known as rattailed maggots. They feed off bacteria in drainage ditches, manure or cess pools, sewers and the like. The fly belongs to the family Syrphidae (which includes insects commonly known as syrphids, flower flies, and hover flies) in the order, Diptera. 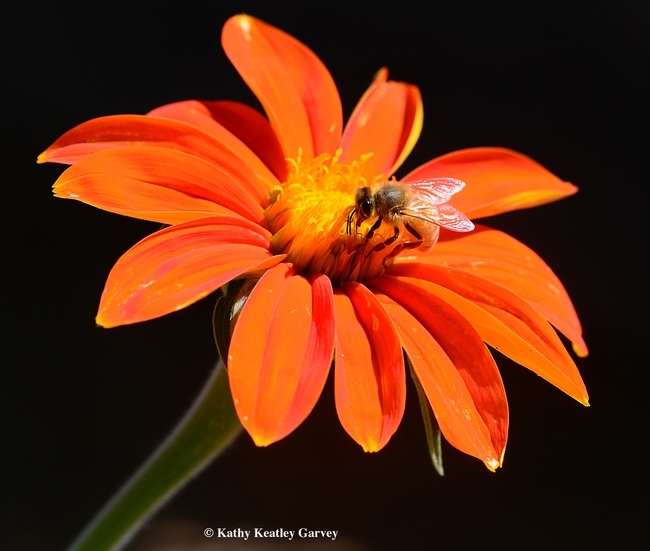 The honey bee is Apis mellifera, family Apidae, order Hymenoptera. One's a fly. One's a bee. Lately we've been seeing scores of drone flies nectaring on our Mexican sunflower (Tithonia). Identify thievery does have its advantages. Wary people and predators often shy away from drone flies, thinking they are honey bees and might sting them. Drone flies can't sting. They can't drain your bank, either.